French tech company Parrot, maker of the AR.Drone quadricopter, has announced the release of the Flower Power in Australia, a wireless plant monitor that works with a dedicated iOS application. Described as a "smart wireless sensor" that uses Bluetooth Low Energy (BLE) technology, the Flower Power uses four built-in sensors to monitor light, temperature, fertiliser level and soil moisture of over 6000 plants across more than 2000 plant species. Once "planted" next to a plant and paired with a compatible iOS device through the company's Flower Power app, the sensor will analyse a plant every 15 minutes, sending data to Parrot's cloud database every two hours. When the plant needs water, fertilizer, shade or sun, a push notification is sent to the iOS device, while users can see historical and live data. The Flower Power app also allows users to access information about specific plants, including a lengthy description and a database that Parrot says will be "constantly updated". Parrot Australia's managing director, Chris Roberts, told Good Gear Guide that Flower Power was developed by agriculturalists and botanists, but stresses the device is aimed at a "wide audience", particularly users who have little experience in gardening. Parrot Australia's managing director, Chris Roberts demonstrates the Flower Power. The Flower Power sensor itself is powered by a single AAA battery that will last up to six months. 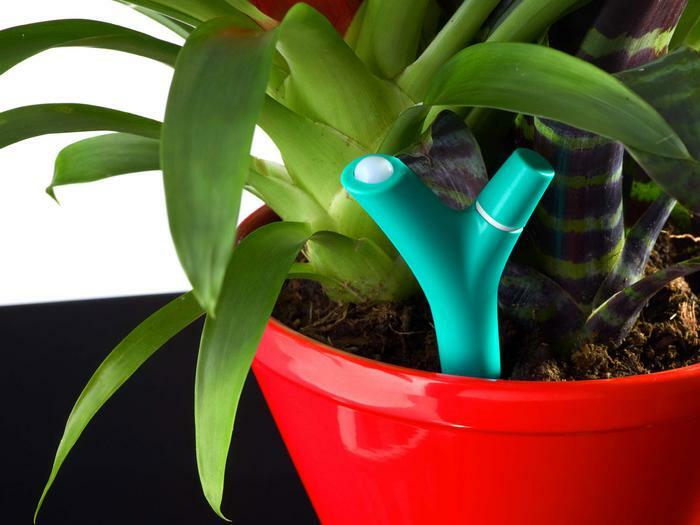 The device is completely waterproof and can therefore be used in plants both indoors and outdoors. Parrot says the product works ideally when planted 5-10 cm around a plant and can be used in a pot, or in soil. While Flower Power will initially work with iOS devices only, Roberts said the company plans to make the device compatible with Android smartphones and tablets running the 4.3 Jelly Bean version of Android and above. However, the company was coy on when Android compatibility will be available, only saying that "Apple was more precise" standardising the Bluetooth Low Energy standard. In addition to the iOS app, which is compatible with the iPhone 4S and above, the 3rd Generation iPad and above, the iPad mini, and the 5th Generation iPod touch and above, Parrot will release a Web based service in "the next few weeks". The Flower Power is available in brown, green and pastel blue colour variants. The Web based log-in will allow Flower Power users to access historical data of any plant connected to the sensor, but will not provide alerts or a live data feed. The Parrot Flower Power wireless plant monitor is available now in Australia through Apple Stores and online, a range of department stores and through selected garden specialists. It retails for $79.99 and is available in brown, green and pastel blue colour variants. Are you interested in the Flower Power? Let us know your thoughts in the comments below!